"Our Job is Service Your Job is Rv'ing..."
Testimonials - Submit Yours Now! Fantastic place, they treat your RV like their own, and they treat you like family. They also don't fleece you for every inspection like many shops. We had RV R&R do a complete pre-purchase inspection today for a class-A '04 Damon Daybreak 3270 chassis & home and they did a phenomenal job! They went through the whole thing from head to toe with a huge checklist. They replaced fuses and topped fluid levels and made sure everything was running good. They provided an itemized list of needed repairs and pointed out those which were urgent. No pressure, super informative, and knowledgeable! We will definitely return to RV R&R! Thanks for the great service. This is Erica, I was in with my Boyfriend Danny yesterday, regarding our cracked toilet. I have been in sales and Customer Service all of my life, and have been a Trainer. Just wanted to say that you are doing a FANTASTIC job. I used to try to train people to speak on the phone the way you do. Straight A's for you! Because of you we have total confidence in your Company's abilities. I hope they know what an asset you are! We have done business with Tim for a while now, you cannot find a nicer guy, or better RV Shop in the area. He has completed every job with professional skill, and always a smile on his face. I would recommend him to anyone with any size recreational vehicle. And there is no one nicer that Tisha when it comes to organizing a campout. We like to Thank all our customers for allowing us to become your RV Repair Shop! We get it right once you are our customer we try to make sure you stay our customer. With our factory trained techs we are a Team like no other. Our techs know how to handle your problems because of their experiences. 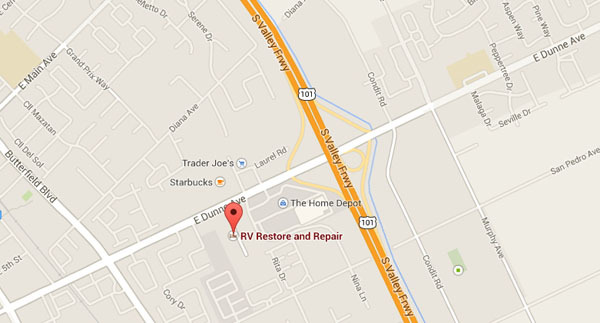 Here at RV Restore and Repair we strive to stand out as "The cream of the crop" in the RV service & repair business. Customer service is of the utmost importance to our staff and we make every effort to treat your RV as if it were our own. We are a family owned business and with that in mind, we work hard to build long lasting relationships with our customers. Since we get to know each customer on a personal level, your coach will be serviced and maintained specifically for your needs. Rather you are full time, part time, or a weekend warrior we will make recommendations that are tailored to you and your coach exclusively. Our customer base reaches far and wide with people coming from as far as Oregon and Nevada to get trustworthy, reliable service. We look forward to working with you to obtain the best RV experience possible. © RV Restore and Repair | Boost Logics Inc.